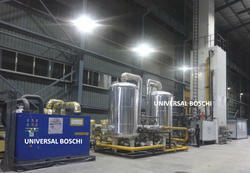 The large capacity oxygen plants of Universal Boschi are designed and manufactured in technical collaboration with ING. L. & A. Boschi of Italy. The name itself defines that it is a large capacity plant ranging from 200 m3/hr to 1000 m3/hr capacity. Once installed, the machine remains firm for years to come with our spare parts or maintenance. The machines we provide are technologically very advanced and perform as per the plants of international standard. 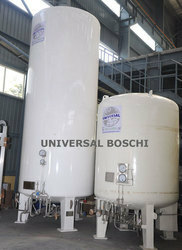 We are leading manufacturer and supplier of Liquid Oxygen-Nitrogen Plant (UBTL- 500 Nm3/hr) in India. Our liquid nitrogen/oxygen plant is being manufactured as per the latest technology design of the Company ING. L. A., BOSCHI, ITALY. This technology has been proven all over the world for its working efficiency trouble free operation. Our Liquid plants come in several capacities ranging from 20 Liter/hour to 10,000 Liter/hour. The output can be stored in liquid storage tanks. We make use of advanced air separation columns for high yield of nitrogen. 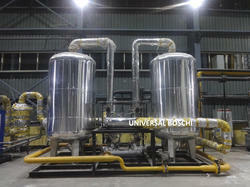 Our liquid nitrogen plant is distinguished by flawless performance, low power consumption, reliability and durability. 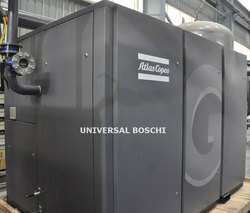 Our Air Compressor is supplied with Atlas Copco rotary screw compressor which are the best in the world and known for its trouble free working. The ROTARY air compressor (AT 7 BAR)compresses the atmospheric air through a highly efficient suction filter which provides the main raw material for the production of oxygen and nitrogen. Cryogenic Turbine Expander with gas bearings can be used for air separation with gas bearings can be used for air separation plants with low pressure cycle. We are leading manufacturer and supplier of Liquid Oxygen Tanks in India. Our liquid nitrogen/oxygen plant is being manufactured as per the latest technology design of the Company. 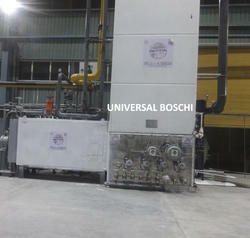 Universal boschi Purification Unit Skid uses wika german reliable gauges with zeochem swiss synthetic zeolites no recurring cost of chemicals new technology-Ce compliance. Universal Boschi manufactures and exports technically updated Air Separation Column (Cold Box) for its clients located all over the world. Boschi technology and design are worldwide popular since 1930, so we completely acquire his technology and design. With the years of experience and presence of technical workforce, we fabricate unmatched cryogenic air separation plant in terms of quality, reliability and durability. We are leading manufacturer and supplier of Liquid Oxygen Nitrogen Tanks in India. Our liquid nitrogen/oxygen plant is being manufactured as per the latest technology design of the Company ING. L. A., BOSCHI, ITALY. This technology has been proven all over the world for its working efficiency trouble free operation. Our Liquid plants come in several capacities ranging from 20 Liter/hour to 10,000 Liter/hour. The output can be stored in liquid storage tanks. We make use of advanced air separation columns for high yield of nitrogen. 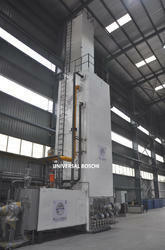 Our liquid nitrogen plant is distinguished by flawless performance, low power consumption, reliability and durability.